Could Alpine Beat Pioneer At CarPlay Delivery To Customers? Alpine Electronics is listed by Apple as the other aftermarket manufacturer which will bring CarPlay to the car you already own. The Alpine versus Pioneer Electronics competition will soon see a new chapter when CarPlay becomes available. Question is, who's going to win the race at CarPlay delivery? There are a few sketchy details about Alpine's upcoming head unit which is expected by October this year. We have those few details and another interesting image of what the Alpine head unit might look like, after the break. Check it out, you won't want to miss it. 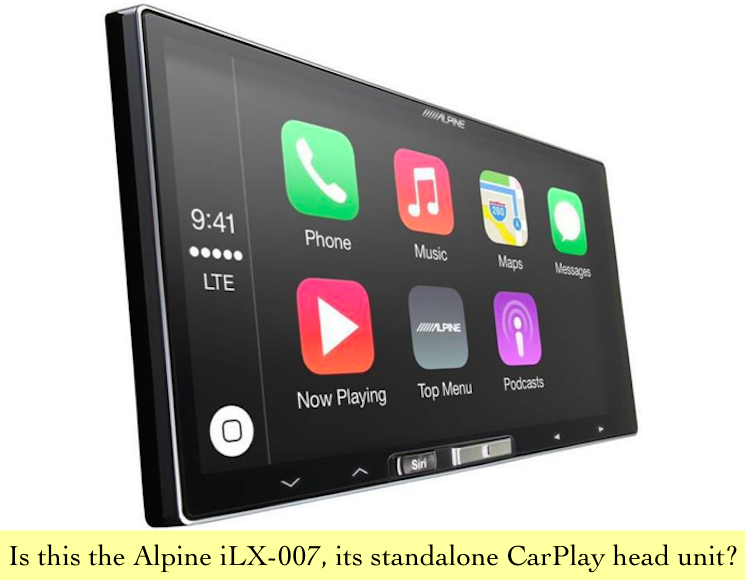 A news post on CEOutlook a few weeks back says that Alpine has hinted at details about its upcoming head unit. According to Alpine's Steve Brown, who was speaking at KnowledgeFest (or Mobile Electronics Show) in Dallas last month, Alpine's head unit is almost ready and "works well and is reliable." Additional details suggest the head unit may be called the iLX-007 and will feature a high tech 7-inch capacitive multi-touchscreen. It will be a double-DIN head unit that will include a separate mic to mount on the A-pilar or nearby. No prototype of the device was on display at the event in Dallas. The device is designed to work specifically with a compatible iPhone capable of CarPlay. It will not have a CD/DVD drive. The report on CEOutlook suggests it won't have Bluetooth either which, if true, raises the question of whether CarPlay requires Bluetooth to work at all. Navigation, music and messaging will be done using CarPlay. The iPhone will be connected to the head unit via a lightning cable. Without the phone, the unit will work as a standalone AM/FM radio. With all the details from the report, it seems like the iLX-007 may not be a very expensive device if it only does CarPlay. Or at least, it shouldn't be. But there are no details available about pricing. Another post on carstereochick.com has posted the above image of what the head unit or at least the screen may look like. We couldn't verify the authenticity of the picture as Alpine doesn't have it listed on their website. 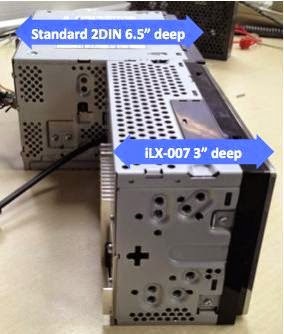 The following picture was also posted on carstereochick.com reportedly showing the actual head unit's size compared to a regular double-DIN receiver. Again, we couldn't verify if this image is of the actual product. So who wins the CarPlay race? At the moment, with Pioneer's promised firmware update for its NEX receivers still MIA, it won't surprise me if Alpine beat them to it. Pioneer technically still has another 10 days or so to release the update in keeping with its "summer" promise. Alpine's head unit is expected in October but if Pioneer can't meet its promise, it could well be Alpine that wins the race. Time will tell. We have contacted Alpine USA for details and will report if we hear any official word from them.